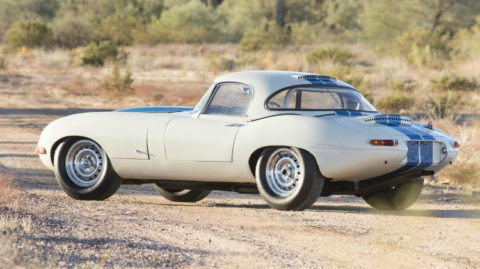 The top result at the 2017 Scottsdale collector car auctions was for a 1963 Jaguar E-Type Light Weight Competition. 35 cars sold for over a million dollar. Bonhams sold a 1963 Jaguar E-Type Light Weight Competition for $7,370,000 as the most-expensive car during the 2017 Scottsdale, Arizona classis car auctions in January 2017. 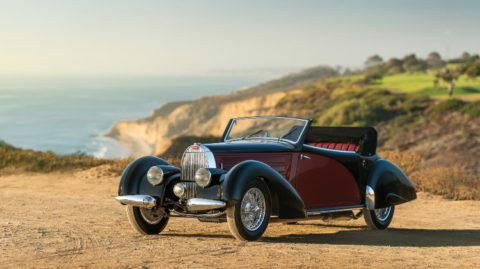 A 1939 Mercedes Benz 540K Special Roadster sold at RM Sotheby’s for $6,600,000 as the second-highest result. Barrett-Jackson was the top grossing auction house with over $100 million in sales while RM Sotheby’s sold 15 of the 35 million-dollar cars at the auctions in Scottsdale and Phoenix, Arizona. The annual Scottsdale classic car auctions in Scottsdale and Phoenix, Arizona, were held from 14 to 22 January 2017. The following auction companies participated: Barrett-Jackson, Bonhams, Gooding & Co, RM Sotheby’s, Russo and Steel, Silver and Worldwide Auctioneers. Hagerty considered the top end of the market (million-dollar-plus cars) and sub-$100,000 market to be stronger than a year ago while cars in the $250,000 to $1,000,000 price range struggled more. 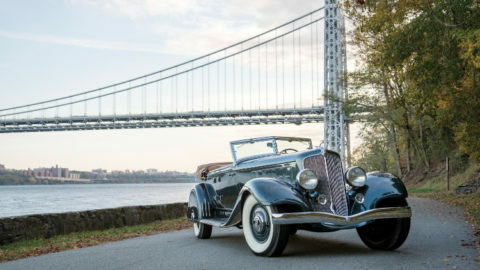 Although Bonhams had the highest average sale price and three of the four highest results, RM Sotheby’s seemed to have judge the top-end market best with a sell-through rate of 89% and only one multi-million dollar failure. Although Bonhams was the only auctioneer with clearly better figures in 2017, the general mood was more positive than after Scottsdale 2016. Although the unsuccessful $10,650,000 bid for the 1960 Ferrari 250 GT SWB California Spider was the highest bid ever at a Scottsdale auction, the $7,370,000 paid for a 1963 Jaguar E-Type Light Weight Competition was the top result at Scottsdale 2017. This is the highest price ever paid for a Jaguar E-Type at auction. The 1963 Jaguar E-Type Light Weight Competition sold by Bonhams is one of only 12 competition lightweight E-Types produced. It was raced in period by Bob Jane in Australia. For the second consecutive year RM Sotheby’s had a good Mercedes Benz 540K result at the Phoenix, Arizona sale. A 1939 Mercedes Benz 540K Special Roadster sold for $6,600,000 as the second-highest result at the Scottsdale 2017 auction week. 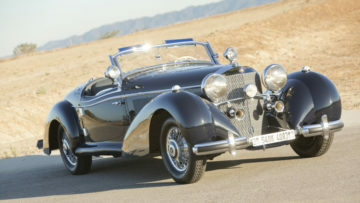 Mercedes Benz produced only 419 cars on the 540K platform with only around 25 fitted with Spezial Roadster coachwork. 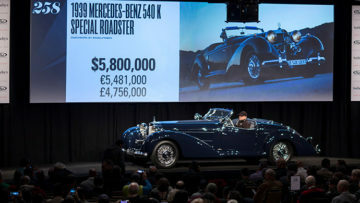 In 2016, RM Sotheby’s set the Scottsdale auction week record when a 1937 Mercedes Benz 540 K Special Roadster sold for $9,900,000 – the third highest price ever paid for a Mercedes Benz car. 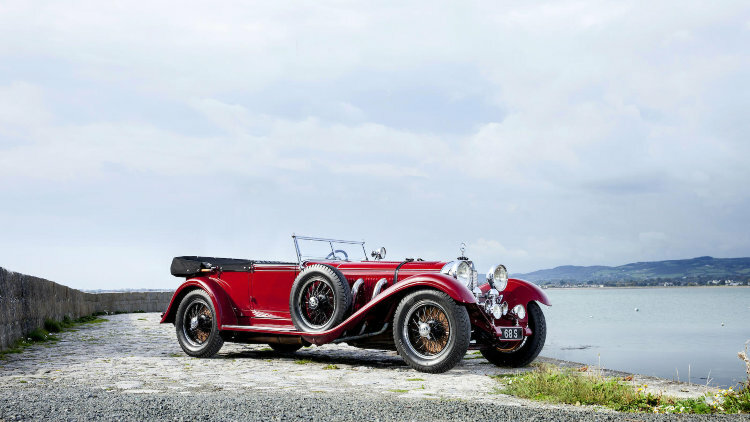 Bonhams also had a good result with a large pre-war car when it sold a 1928 Mercedes Benz Typ S 26/120/180 Supercharged Sports Tourer with original coachwork by Erdmann & Rossi for $4,812,500. These large Mercedes Benz cars, designed by Ferdinand Porsche, were described as the Car for Kings. The Great Depression ensured that only 174 were ever produced. The prices of Mercedes Benz 300 SL cars were very much on the up in 2014 and most of 2015 but prices have been weaker in 2016 with million-dollar results not always guaranteed and $1.5 million bids hard to come by. 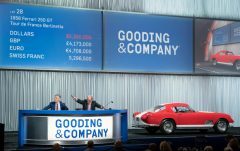 The market seemed back on track when a 1955 Mercedes Benz 300 SL Gullwing sold for $1,457,000 at Gooding – well above the $900,000-$1,100,000 pre-sale estimate. This car was described a garage find – unrestored but in good, original condition. Significantly, it was offered for sale by the original owner. However, the following day Gooding failed to get a million-dollar bid for a 300 SL Roadster that finally sold for $1,034,000. 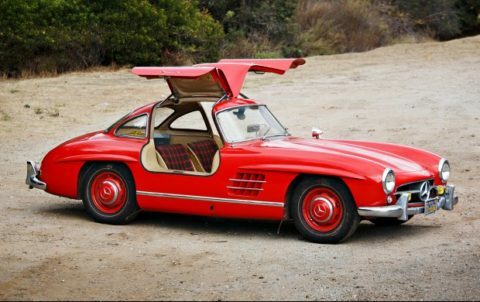 A Gullwing at RM Sotheby’s also failed to reach the reserve margin. Eleven Ferraris sold for more than a million dollar at the Scottsdale, Arizona 2017 auctions with a further five failing to sell despite million-dollar bids. The top result for a Ferrari at Scottsdale 2017 was $6,380,000 paid for a 1952 Ferrari 340 America Spider Competizione at Bonhams – a new model record. This ex-Scuderia Ferrari racing car participated in the 1952 Mille Miglia, 24 Hours of Le Mans and the Targa Florio but failure to complete these races and no top finishes prevented a higher result. The car was driven by amongst others Piero Taruffi, Maurice Trintignant, and Giovanni Bracco. Two further model records were set RM Sotheby’s when a 1969 Ferrari 365 GTS sold for $3,602,500 and a 1995 Ferrari F50 for $3,135,000. Only 20 of the Ferrari 365 GTS spiders were ever built with the new record nearly triple the previous highest price paid. The F50 is one of only four produced in black with the price paid well above the $2.4 million achieved for F50s in 2016. Two of the most-expensive Ferraris new during the 1960s sold around expectations: a 1961 Ferrari 400 Superamerica SWB Coupe Aerodinamico by Pininfarina for $3,080,00 at RM Sotheby’s and 1965 Ferrari 500 Superfast for $2,915,000 at Gooding. Tommy Hilfiger’s 2003 Ferrari Enzo sold for $2,695,00 at RM Sotheby’s while a yellow 2003 Ferrari Enzo failed to clear the reserve at Bonhams with a highest bid of $2,350,000. RM Sotheby’s sold a 1966 Ferrari 275 GTB/6C for $2,117,000 while Bonhams sold a 1966 Ferrari 275 GTB for $1,732,500 – both results well under expectations. Two 275 GTBs at Gooding failed to sell despite bids around $2.5 million. A 2011 Ferrari 599 SA Aperta sold for $1,495,000 at Gooding – a result well above expectations that set a new model record. A new model record was also set when Justin Bieber’s 2011 Ferrari Italia sold for $434,000 at Barrett-Jackson. The 1960 Ferrari 250 GT SWB California Spider at Bonhams that failed to sell attracted a highest bid of $10,650,000 – the highest ever bid during the Scottsdale week. No pre-sale estimate was released and the reserve margin is not known but California Spiders have sold for around $5 million more at recent auctions. Amelia Island or Monterey may be a more suitable event for a California Spider. 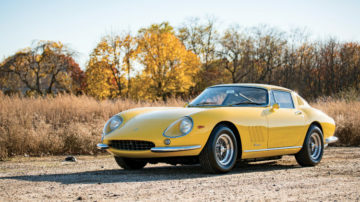 Other high-profile Ferraris failing to sell include two Ferrari 275 GTBs at Gooding that attracted highest bids of $2.5 million and $2.4 million. 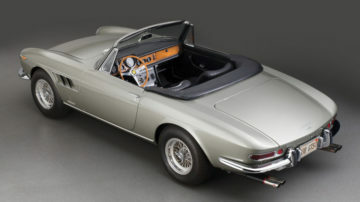 The two 275 GTBs at RM Sotheby’s and Bonhams also sold below expectations. A 1990 Ferrari F40 failed to sell at RM Sotheby’s. None of the five Ferrari 365 GTB Daytonas on offer at the various Scottsdale 2017 auctions sold. Bonhams sold a 1971 Ferrari 365 GTB Berlinetta for $1,155,000 at Scottsdale 2016 but that result has not lifted every car to a million dollar deal. A further four Ferrari 365 GTBs will be on offer at the Paris auctions in February 2017 to clearly turn it into a buyers’ market. 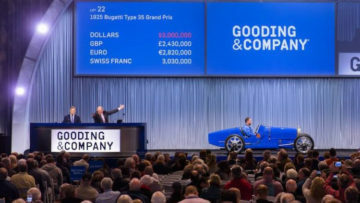 Gooding set a new model record when a beautiful 1925 Bugatti Type 35 Grand Prix sold for $3,300,000. This car is in a very original condition with original engine, chassis and bodywork despite being raced in period. 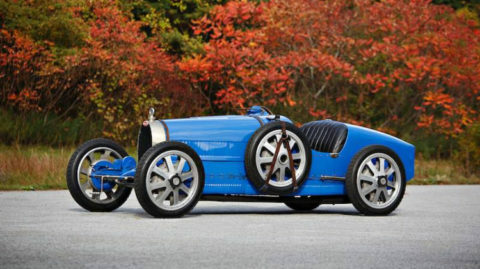 Gooding also sold a half-size version of the Type 35 car: the children’s electric 1928 Bugatti Bebe for $88,000. Bugatti made 500 of these cars, sometimes referred to as the Type 52, of which around 100 survived. Another one will be on offer at Artcurial’s Paris sale in February 2017. RM Sotheby’s sold a 2013 Bugatti Veyron 16.4 Super Sport produced for $2,090,000 – it sold for $2.3 million at RM Sotheby’s Monterey 2015 sale. This was the last of the 300 cars produced. At Barrett-Jackson, Floyd Mayweather’s 2011 Bugatti Veyron Grand Sport received a similar highest bid of $1.9 million but failed to clear the reserve margin. RM Sotheby’s sold a 1939 Bugatti Type 57 Cabriolet by Letourneur et Marchand for $1,017,500. However, the best Bugatti result for the year is expected from the super elegant 1937 Bugatti Type 57S Cabriolet that will be on offer at RM Sotheby’s Amelia Island sale in March 2017. Two quite different Chevrolets sold for over a million dollars: $1,980,000 was the highest result at Worldwide Auctions for a 1967 Chevrolet Corvette 427/430 Convertible, while a 1960 Chevrolet Engineering Research Vehicle (CERV) 1 achieved $1,320,000 at Barrett-Jackson. 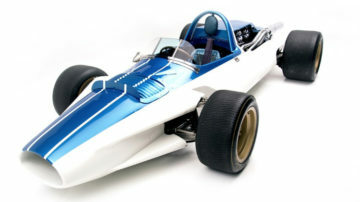 This car was never raced but served a development test bed for various Chevrolet models. Two Shelby Cobras – a 289 and 427 – sold for $1,100,000. A 1948 Tucker 48 sold for $1,347,500 – only 51 Tuckers were ever built but amazingly 47 survived. This Tucker has covered less than 8,000 miles. 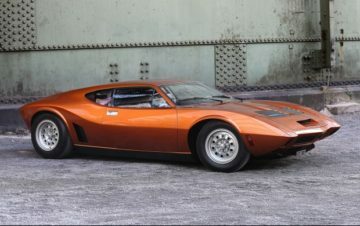 Gooding sold a 1969 American Motors AMX/3 for $891,000 – a new marque record. 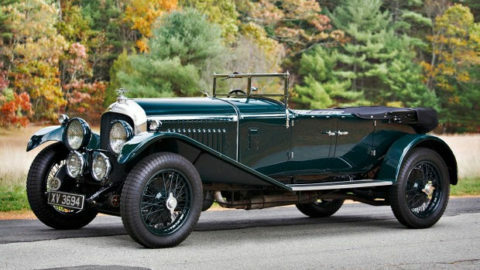 Bonhams achieved $2,805,000 for a 1931 Alfa Romeo 6C 1750 5th Series Supercharged Gran Sport Spider. The car has a known history from new and still has its original Zagato coachwork. 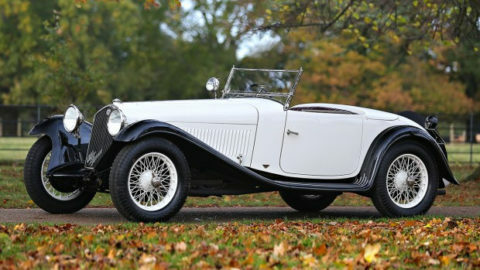 Gooding sold a similar era 1932 Alfa Romeo 6C 1750 Series V Grand Sport Roadster for $1,595,000. RM Sotheby’s sold a 2008 Lamborghini Reventon for a strong $1,320,000 but failed to sell a 1971 Lamborghini Miura P400 SV, estimate $2,300,000 – $2,600,000, – the only multi-million-dollar lot RM Sotheby’s failed to sell. 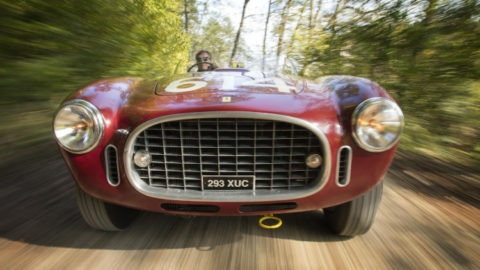 Worldwide Auctions sold a 1955 Lancia Aurelia B24 Spider America for $1,100,000. Porsches continued to sell well at Scottsdale 2017 despite the high numbers on offer. At the top of the market, not that many Porsches were on offer in Scottsdale and only two sold for more than a million. 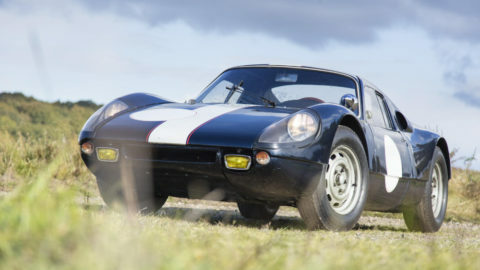 Bonhams set a new model record when it sold a 1964 Porsche 904 GTS for $2,310,000. The only other million-dollar result for a Porsche was $1,089,000 for a 1988 Porsche 959 Komfort. A similar model sold for $935,000 at RM Sotheby’s. Neither car was particularly good examples nor were results far off expectations. A 1988 Porsche 959 Roadster Re-Creation with a 1600 cc engine of some sort sold for $21,450 at Barrett-Jackson. 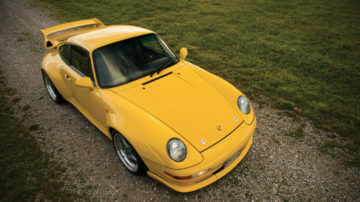 Two 1996 Porsche 911 (993) GT2s failed to sell even with lower estimates just over a million dollar. After RM Sotheby’s sold one of the 56 GT2s Porsche had produced for road use for a whopping $2.5 million at London 2016 expectations of sellers have lifted faster than the intentions of buyers. Many Porsche 356s in a variety of models were available and prices seem to be rising. Bonhams sold a fully restored 1956 Porsche 356A 1600 Speedster for $528,000 while Gooding got a good $341,000 for a garage-find 1958 Porsche 356 A Super Speedster – well above the $200,000-$275,000 pre-sale estimate. Three Aston Martin DB5s sold for more than a million dollar in 2014 but such result was not duplicated in 2015 or 2016. Three were available at Scottsdale 2017 with Gooding selling a 1964 Aston Martin DB5 for $880,000 while RM Sotheby’s sold a 1965 Aston Martin DB5 for $1,045,00. 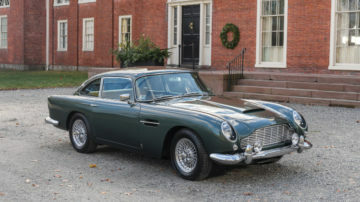 However, Barrett-Jackson surprised when the top result of its nine-day auction series was a 1964 Aston Martin DB5 selling for a very strong $1,485,000. The only other British million-dollar-plus result at Scottsdale 2017 was a 1928 Bentley 4 ½ litre Open Sports Tourer that achieved $1,100,000. In the same auction, a 1936 Squire 1 ½ Litre Touring received a highest bid of $1,050,000 – the company produced only seven cars in all. A new model record was set when the 1956 Austin Princess that belonged to John Lennon sold for $159,000. A highest bid of £135,000 ($180,000 at the time) for the same car was rejected at RM Sotheby’s London 2016 sale. The next major classic car auctions are in Paris in February (Artcurial, Bonhams, RM Sotheby’s) and Amelia Island, Florida in mid-March (Bonhams, Gooding, RM Sotheby’s). Scottsdale 2017 Results: Barrett-Jackson, Bonhams, Gooding, RM Sotheby’s. Scottsdale 2017 Previews: 2017 Scottsdale and Arizona Auctions Preview, RM Sotheby’s Arizona Preview, Bonhams Scottsdale Preview, Gooding Scottsdale Preview. 2017 Pre-Auction Announcements: Bonhams (Porsche 904, Ferrari 340, Jaguar E-Type), RM Sotheby’s (1933 Chrysler CL), Gooding (Bugatti Type 35, Sports Cars, Performance Cars), Barrett-Jackson (Shelby Mustangs, Rare Mopars). 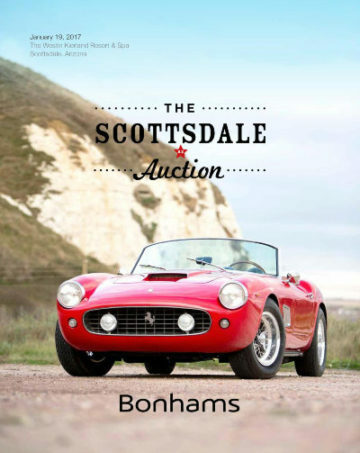 Scottsdale (Arizona) – The First Classic Car Auctions of the Year.